The Kenwood Chef is a classic piece of kitchen equipment that generations of cooks have used. It is a supremely competent mixer, but it is even much more than that. Its strength and enduring appeal come from its bullet proof ruggedness and its incredible versatility. The variety of attachments can do anything from making sausages to mixing cocktails. The original Kenwood Chef was an industrial looking mixer. This design was reasonably successful in the fifties. However, a new product was needed for the 1960s. Ken Wood, the Managing Director of Kenwood, asked another Ken, Kenneth Grange, to restyle the Kenwood Chef. Kenneth Grange took the basic mechanicals of the Kenwood Chef and gave it a sleek, new skin for the 1960s. Gone were the rounded curves of the fifties' design, and in their place was a modern, squared off look that gave the Kenwood Chef a high-tech desirability. The classic Kenwood Chef has stayed true to this original concept. Initially the new design did not go smoothly. Late delivery of a new machine needed to manufacture the restyled Kenwood Chef resulted in a profits warning for Kenwood in 1960. However, sales picked up quickly once the new Kenwood Chef was in the shops. The Kenwood Chef's styling set it apart from other domestic appliances. 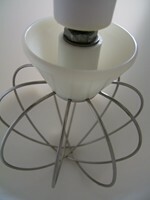 It was an aspirational object for 60s housewives. It was one of those rare objects that captured the mood of the times. In spite of the liberation of women, in the 60s cooking was still trendy. Top TV chef of the time, Fanny Craddock, emphasised the glamour of dinner parties and cooking at home. The Kenwood Chef gained the status of a luxury piece of kitchen equipment. The advertisements claimed: 'Is there anything the Kenwood Chef can't do?'. The Kenwood Chef mixer introduced a revolutionary action. Its beaters moved in an elliptical orbit whilst rotating at the same time, as the planets go around the sun. The marketing men loved the high tech sounding 'planetary action'. 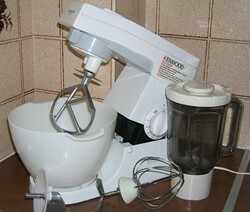 The Kenwood Chef came with several mixing attachments, the K-beater, with the company's famous 'K' logo, a whisk and a dough hook for making bread. The Kenwood Chef was capable of doing many tasks in the kitchen, including liquidising, peeling, mincing, slicing, shelling and extracting juice. Extra attachments could be purchased for these many tasks. The original Kenwood Chef was not cheap. It cost 30 guineas in 1966 (around £400 in today's money). You could also get the original Kenwood Chef by saving Green Shield Stamps. The Green Shield Stamp Catalogue gave the Kenwood Chef the ultimate accolade, when they added it to their exclusive group of products called 'the finest in the land'. The Kenwood Chef was such a ground breaking design in the sixties that it has not been bettered by anything more modern. Nothing makes a sponge cake like a Kenwood. You can walk away and leave it to take care of the cake mixture whilst you get on with something else. The Kenwood makes light of Christmas, wedding and birthday cakes. It also makes fantastically light meringues. The liquidiser can make great breadcrumbs, purees, soups and mayonnaise. The attachments are easy to fit and simple to use. The Kenwood is easy to clean and maintain. The new Kenwood Chef Classic is a lightly restyled version of the original sixties version. This Kenwood Chef Classic, right, from Amazon, includes the K beater, balloon whisk and dough hook, just like the original from the sixties. It also includes the liquidiser, which would have been bought separately with the original Kenwood Chef. The Kenwood Chef balloon whisk is used for whisking egg whites for meringues, omelettes, whipping cream and mousses and fatless sponge mixtures, like Swiss rolls. Its balloon shape allows the user to maximise the air incorporated into the mixture, thus making the texture light. The Kenwood Chef K beater has the Company's distinct 'K' logo. 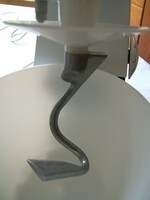 It is used for mixing cakes and pastry. It is particularly good for rubbing the fat into the flour when making shortcrust pastry. The K beater is also handy for mixing rich fruit cakes, like wedding cakes and Christmas cakes, as it takes the arm work out of stirring the heavy mixture. 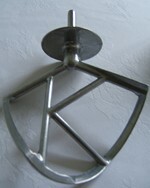 The dough hook is used for kneading dough for bread, pizza bases and pasta. It is a lot easier to use the dough hook than to knead the dough by hand and cuts the time taken on the task in half. 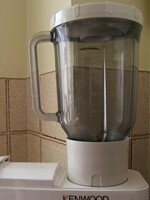 The liquidiser has a variety of uses including pureeing vegetables and fruit for soups and smoothies. It can also be used make bread crumbs and chop nuts. Kenneth Grange also designed the Kenwood Chefette, a smaller, hand held version in 1966. This was a more affordable way to get some of the Kenwood Chef style in your kitchen. The Kenwood Chefette cost £11 16s in 1966, but a stand and bowl were £3 19s extra (still £150, for the Chefette without the bowl, in today's money - compare this with the prices of modern, hand held mixers). The Chefette had some of the features of the Kenwood Chef, such as several speeds of operation and it also came with a liquidiser. The Chefette did not have the build quality of the Chef, and did not last as well. Boots also produced their own version of the Kenwood Chefette in the 70s. In the 70s, the Kenwood Chefette gained and orange and white colour scheme. You can get spares for the Kenwood Chef on eBay, whether you have a classic A701 or an A901 from the sixties or seventies or a more updated model. We often look at the posts dealing with Kenwood Chef's. 99.9% of the people who post are asking about help with parts that they cannot find or repairs they need. We are the largest supplier on eBay of Kenwood used and re-manufactured parts and new motor repair kits. Hi Amjad. There is a manual for the Kenwood Chef KM200 on this site. I've had a quick look on the internet for a manual for a Kenwood Chefette A340, but I can't see one. Translation: I have the Kenwood A927 cream maker and I do not know how to use it to make cream. There is no indication of the ingredients - thank you for your response. According google translation from Danish: I lost my manual, hope you can help me thank you in advance! "The Kenwood Chef is a very good machine BUT unfortuately ours went wrong just outside the warranty period and need new parts in the gearbox/drive mechanism on the top. Hi Kamila, More on this... I spotted this compatibility chart on another site Kenwood Chef attachment compatibility. I hope this helps. "Hi, can you help me age my kenwood please. It is A701a but it is completely blue with dark blue control knob, the bit on the front that says kenwood & the bit on the top that you take off to put the liquidiser on. I have seen the whit & dark blue & white 7 baby blue but not the one i have. "Hi, I've been given a kenwood chef a701a. I've been using the top bit to make milkshakes/smoothies but can't work out how to switch it from blender mode to the mixmaster bowl mode - can you help?? They also have a page cross referencing models and attachments so you can easily see which attachements fit which machines. I got my A901E repaired, it came back regreased and quieter. They arranged courier collection and delivery. However, they are closed until June 1st for workshop renovation but worth putting into favourites for later use. I have an old Kenwood Chef A700. I am looking for a mixing bowl, but I see only a mixing bowl for the A701. Is the Mixing Bowl for the A701 compatible? "We need part 17381, a gear, for a kenwood chef a701a. "We had bought a Kenwood Chef about 16 years ago in Canada and later bought the mincer attachment in Singapore. We later found that the mincer was not working well with the Chef. As the mincer was extruding the minced meat, it made a grinding noise. Perhaps the attachment I got was not fully compatible with my Chef. Kenwood made different machines for different parts of the world. Can someone help me to get the right mincer if I provide the serial number or model number which is on the bottom of the base of the Chef? "I have a Kenwood Major mixer - Model A907D, Serial # 0223644. "K model 701A- running hot, noisy and smelly. I have dismantled and cleaned the flour/sugar/fat/oil accumulation inside the housing. Does anyone know of a repair shop in Kent? I have just bought a Kenwood Major from a women on preloved( she assured me it worked..) and it does not work. I've changed the plug but still nothing. I have a KM310 and I would like to know how to clean the liquidizer becuase at the base all the food get traps in seal at the bottom. Does the base come apart? for my Kenwood Chef 701A? "I have just purchasd a 2nd Hand Kenwood Chef KM200 and separately bought an As New Unused Cream Maker A727 and a New Mincer Attachments. I cannot get either attachment to fit on examining the Slow Drive Port on the KM200 the bayonet Locating Groove is at the top whilst the Bayonet pin is on the bottom of both attachments. Is this correct ? Have I bought the correct attachments? I thought they were broadly universal. Or has the KM200 some how been assembled wrongly. I cannot see how as the release pin is working correctly and in the correct and seemingly only hole in the sleeve which also seem tho be upside down for fitting. Any help you could give would be gratefully received. "Does anybody know how to dismantle a Kenwood A700 ? It is leaking oil and I would like to clean it but can't get the top of. "Hi I think I have an old stainless steel bowl for an A700D - anyone know what the measurements for a A700D is? "Hi, I have just purchased a second hand Kenwood Major KM250 but it doesn't have any instructions. Do you know where I can get these, please? "I have an original Kenwood chef A700 /1949 in working order.All original attachments including a blender. Anyone interested in buying itt? Can anyone tell me whats the difference between a Kenwood A901 series & Kenwood Chef Excel KM210 series please?? 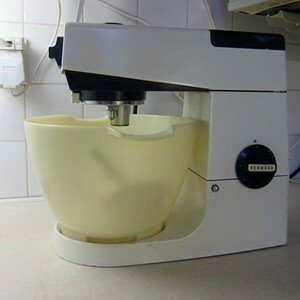 "I have just bought a brilliant Kenwood Chef 200 on Ebay and would now like to buy more attachments for it. Will the present day attachments fit a 200? "I am in need of Kenwood Revolving Planetory Mixer . Can you advise me where I can find in INDIA ? I also have a Kenwood KM210 Mixer, I mucked up and got the slicer attachment (A728) for the older model, it doesn't fit mine, now I can't find the right attachment, is there one? What is it's code please? "I have two very old A 795 Chef models and two mincers which I either purchased or one that came with the other model I purchased second hand. I can't find where to attach them. I am convinced I have used the one I purchased new on the A 795 Chef but when I look at the list of attachments that go with the A 795 it would appear they don't fit. I am confused or maybe I used my mother's old mincer and my memory has failed me! I am a mech/elec engineer by trade and was asked by my mother in law to have a look at her 1960s A707A Major because it faulty. The fault was mainly do to degradation of the motor mounting rubbers causing the motor to drop. I have scoured the net trying to find these parts but drawn a blank. I'm thinking of trying to have some made via my trade contacts, but to justify the tooling I would have to buy hundreds. If I do this, I'd have to hawk the remainder around the many spares outlets. "Replying to Vicky - comment from 16th August. Can anybody help.. I need spares for Kenwood Chef Model A701a... A robber stabiliser for the motor and feet for this much loved machine... ..
"I have a KM200 and although I've had it years I have forgotten how to disable the beater when shredding. Would be grateful for any advice, thanks. "I was given my grandmas chefette that she bought back when it came out. It still works brilliantly and I hope my own children will be able to inherit it one day. I use it to make the best cakes ever as we still have the original stand and bowl. I have no idea what I will do when it dies on me, probably look for someone who can repair it! I wish companies still made things that can last a lifetime or nearly 4 generations in my case but alas they don't seem to! "Hi, I am looking for a Slow Speed Slicer & Shredder (A948) for my KM210. Is it true that a A728 would fit my machine??? Your answer would be very much appreciated. "Any attachments starting a7 will only fit models starting with a7. Any attachments starting a9 will fit al a9 models and most KM's. "i mislaid the connector bit that connects the liquidiser and shredder to my kenwood chef km210. where do i find a replacement? "Hi all, we now have a website for those hard to find Kenwood parts. We even have obsolete parts remanufactured. Please come along and have a look. I would like to know why does the part under the arm where you insert the attachments turn when you are using the liquidizer on the top of the machine ?? I didn't know it would turn and while I was using the liquidizer that part started turning and I had the whisk attachment in the bowl and it ended up damaging my whisk. I was devastated when one of the wires on the whisk pulled out. I know now to ensure the bowl is empty before I start the liquidizer up. Is there anyway to stop that part from turning ?? I have a Kenwood Blender BL740 which only works if I jiggle the jug around in its seating. There is a small black button/trigger upon which the jug sits; the machine only works if the jug depresses the button sufficiently. The button appears to be broken. Please can someone tell me what the black button/trigger is called so I can try to repair it? Kenwood diagrams do not show this part. "If anyone is looking for an excellent repairman for your Kenwood Chef, I can thoroughly recommend Mike at Kenmix Engineering in Gosport, Hants. He really knows his stuff and that's all he does - repairing and renovating Kenwood Chefs. He's just repaired and serviced mine as it blew up recently.